Your know your dog has an issue with you cutting his nails, when he panics from the moment he sees you going for the nail clippers. 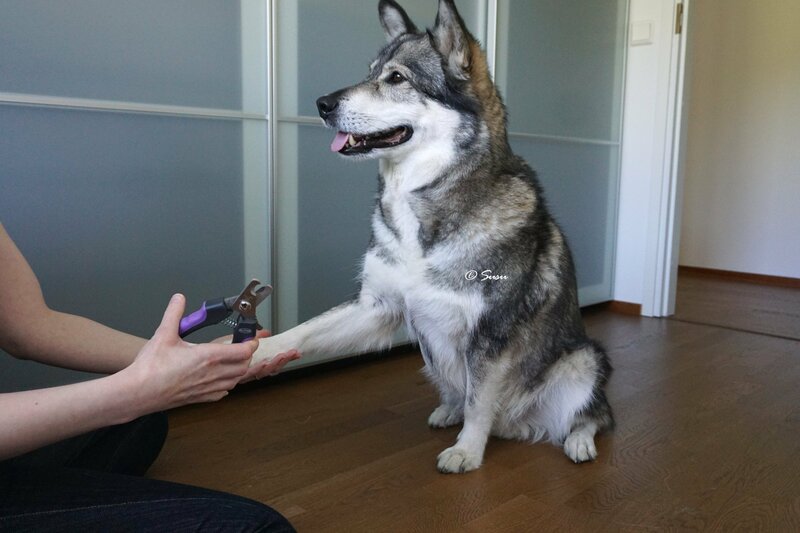 If your dog is REALLY scared and for example hides under a sofa it’s best to get rid of the nail clippers and buy some other tool, like nail tongs. If your dog’s fear is mild you can continue using the same tools as before. When your dog is calm you can start desensitizing your dog to the new tongs. Notice that your dog doesn’t yet know what they are for so don’t feed your dog’s fear and remember to stay calm and positive near the new tool. Remember to start the desensitizing process early, at least a couple of weeks before your dog’s nails needs to be trimmed. If you have always cut your dog nails on the bathroom floor I recommend that you start the training for example in the livingroom. You should do the training on a carpet so your dog’s paws don’t slip - which can create more fear. I took these photos in one session, because Miki doesn’t have any issues with cutting his nails. In reality these steps would take at least 20 training sessions. It’s essential to think the process through before you start. And when you do, try to step into your dog’s shoes and think this also from his point of view. 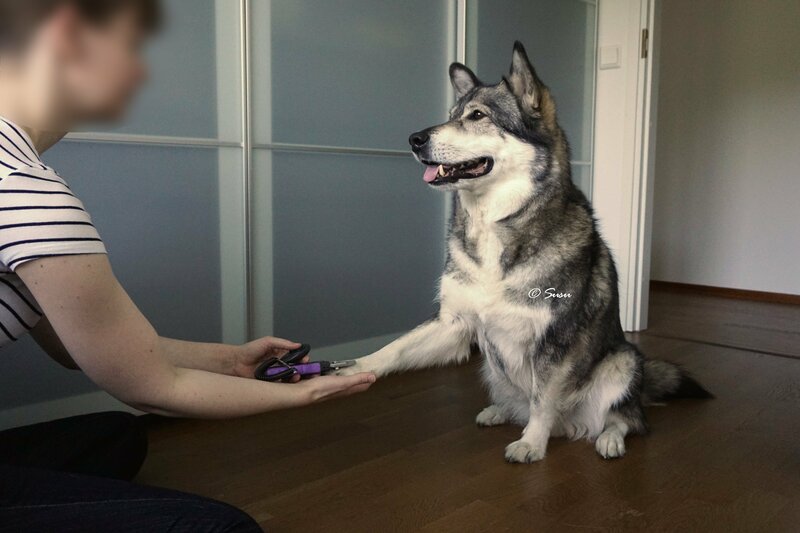 If we want to desensitize a dog to the nail clipping (or something else) it’s best to get the dog to think that the tongs (or some other thing) predicts a reward. 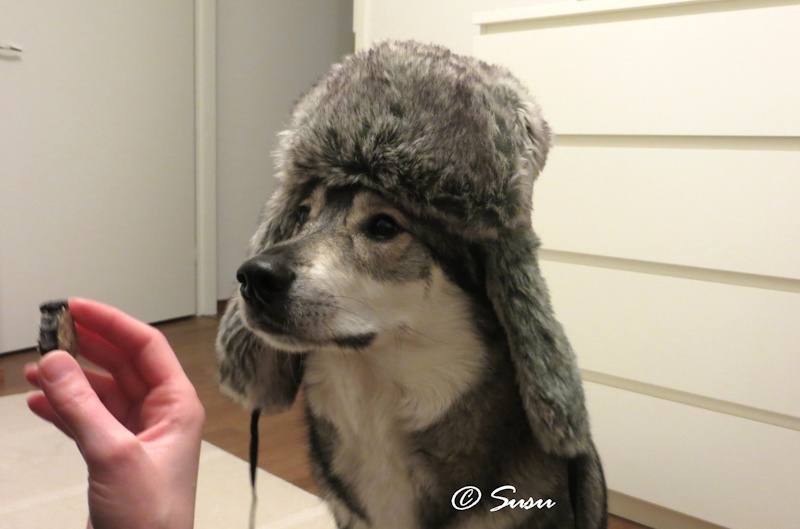 You might have heard about Pavlov’s experiments with dogs. 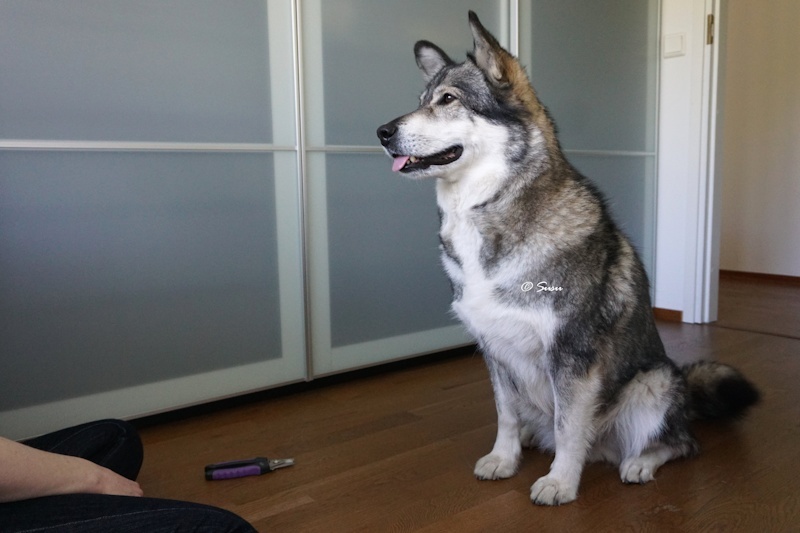 He conditioned dogs to a ringing bell that was followed by a food reward. At first, every time the bell rang a food reward appeared. After a short while the dogs begun to salivate when they heard the bell ringing, because they had been conditioned to that sound which predicted food. Later on the dogs also salivated when they heard the bell but there was no food reward available. The expectation of food after hearing that bell got the dogs to salivate. Put the tongs on the floor but don’t do anything with them - just let them be there and reward your dog for being calm. Your dog may want to sniff them and that’s okay. You can reward him for doing that as well. The next step is to touch the tongs on the floor with your hand and reward your dog when he’s calm. After that you can pick the tongs up and and put them down and reward your dog just like before. The next step is to ask your dog to give a paw when the tongs are on the floor and reward him for doing that calmly. 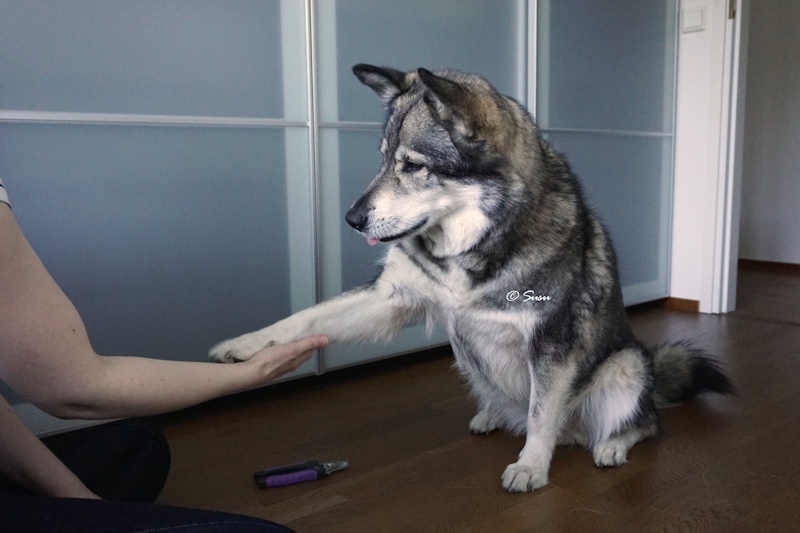 Later on you can touch the tongs that are on the floor when your dog gives a paw and slowly make progress towards you taking the tongs to your hand while your dog’s paw is in your hand. It’s very important you desensitize him to the tongs slowly. If you rush your dog might get scared and then you are back in square one. It’s best to keep the training sessions short - just 1 to 3 minutes at a time. And remember to reward him with something that he really enjoys. When you have advanced and you can hold your dog’s paw while holding the tongs you can move forward. 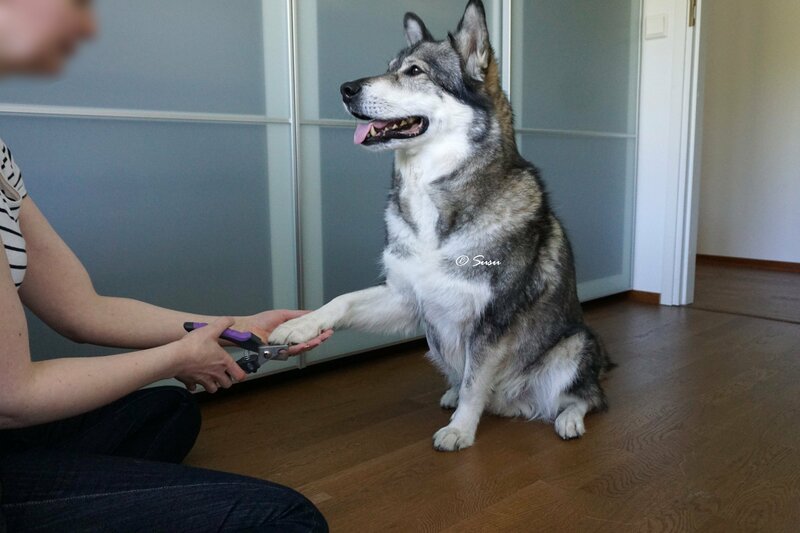 Now you can start touching your dog’s paw gently with the tongs or stroke his paw with them. 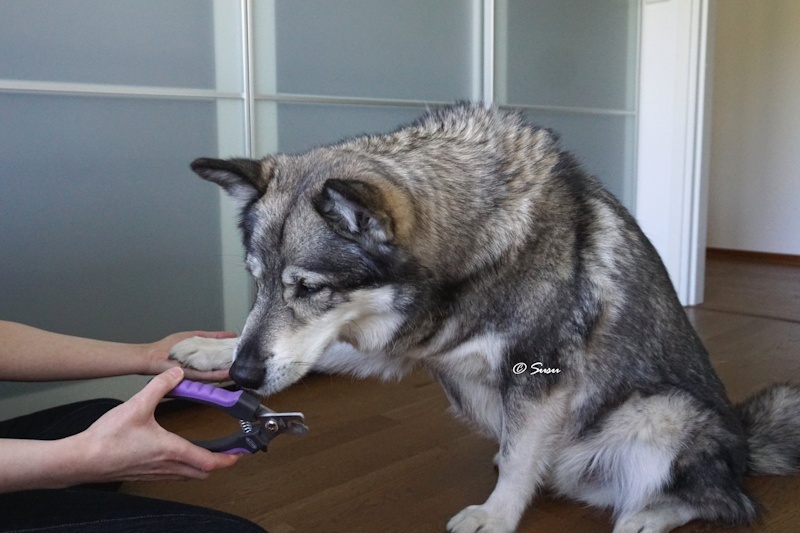 Later on you can clip the air with the tongs near your dog’s paw but don’t try to cut his nails yet. If your dog wants to sniff the tongs let him do that in his own pace. When you master the previous steps you can start cutting the nails. 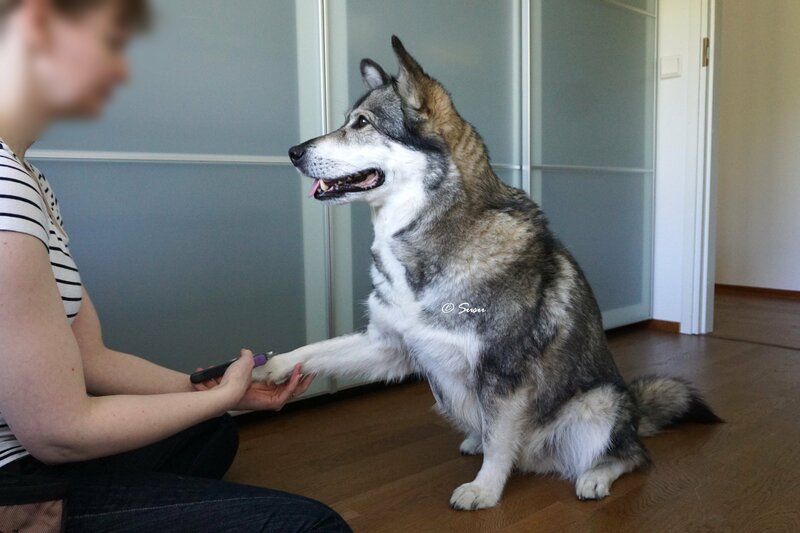 It’s best to start as slowly as possible and cut only one nail per training session and reward your dog heavily when you do. You can add more steps between the ones I presented here. It’s always better to make a slow progress towards your goal than to fix the problems occured by rushing too fast. 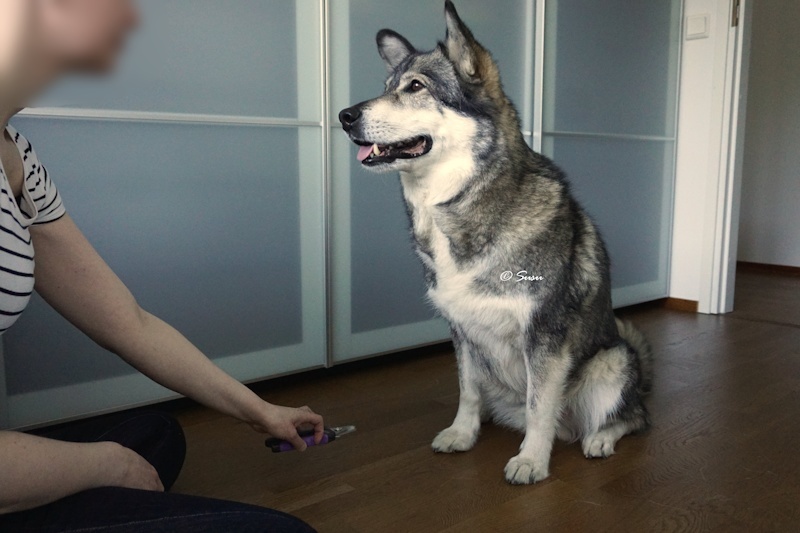 You can use this type of training to desensitize your dog to almost everything. If your dog barks at the doorbell you can always change the doorbell to a new one that has different ringing tune and start from there. 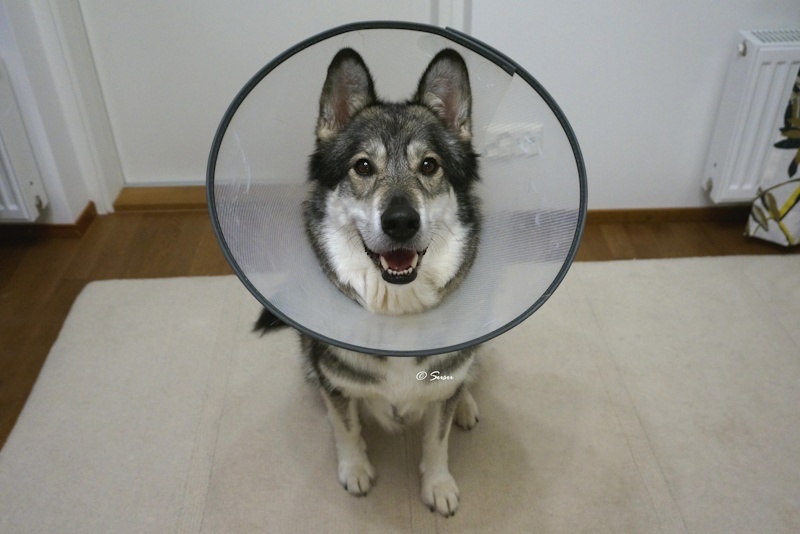 Or if you know your dog is going to have some operation that requires the dog to wear a protective collar, you may want to desensitize your dog to wear the protective collar before the actual operation.